T0052 : 3.7 volt 1100mAh rechargeable Li-ION battery for Magellan Maestro GPS units. Fits in GPS model #s 3000, 3200, 3210, 3220, 3225, 3250. CS-MR1400SL : 3.7 volt 1300mAh Li-ION battery for Magellan RoadMate GPS units (model #s 1400, 1412, 1430, 1445, 1445T). Replaces original battery B5390-B101-0780. CS-MR1200SL : 3.7 volt 1200mAh Li-ION battery for Magellan RoadMate GPS 1200, 1210. CS-MR2000SL : 3.7 volt 1250mAh Li-ION battery for Magellan GPS 2000, 2200T, 2250T. 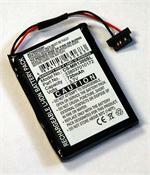 37-00025-001 : 3.7 volt 1300mAh Li-ION battery for MAGELLAN eXplorist GPS systems etc. 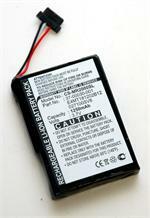 37-00025-001 : 3.7 volt 1300mAh rechargeable Li-ION battery for MAGELLAN GPS systems. ORIGINAL factory brand product! Fits Magellan models 300, 300r, 360, 400, 500, 500LE, 600, 700, 210, SKYGOLF, eXplorist, etc. 361-00046-02: 3.7v 840mAh rechargeable Li-ION battery for GARMIN Nuvi 3700, Nuvi 3760, 3760T, 3790, 3790T etc. Includes tool set for installation. GPSCOM 190: 7.2 volt 1700mAh Insert for Garmin 190 battery. This rechargeable Ni-Cd battery goes inside the GPSCOM 190 Battery Casing. BP-396: 8.4 volt 2200mAh rechargeable Li-ION battery for GARMIN GPSMAP 496, 396, 376C, 296 etc. This is a Batteries America brand product. Replaces original battery #s 010-10517-01, 010-10517-00, etc. 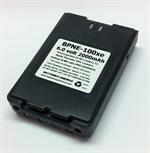 The BPNE-100xe is a 6 volt 2000mAh ready-to-use rechargeable Ni-MH battery for Apollo Precedus GPS. Clips onto the rear of the unit. Made with SANYO enbeloop NiMH cells. EXCLUSIVE. BPNE-100xs : 6.0 volt 2500mAh Ultra Long Life rechargeable Ni-MH battery for Apollo Precedus GPS. Clips onto the rear of the unit. These battery packs are made by US right here in the USA. Rebuilding service for Garmin GPS100 battery. We will re-build your existing battery with new upgraded rechargeable batteries. Specs: 7.2v NiCd 1700mAh. BLI-TRB1 : 7.4 volt 2200mAh Li-ION battery for Trimble Survey instruments. Replaces battery #s 52030, 54344, 46607, 38403, 29518. Fits Trimble model #s 5700, 5800, MT1000, R7, R8, Telxon, TSC1. 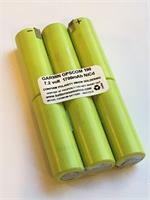 BPNE-100xxe : 6 volt 2550mAh READY-TO-USE rechargeable NiMH battery for Apollo Precedus GPS. 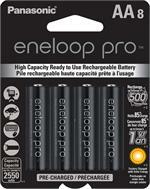 Made with eneloop pro 2550mAh cells - exclusive from Batteries America! BLI-TRB3 : 7.4 volt 2600mAh extended-life Li-ION rechargeable battery for Trimble survey instruments. Replaces battery #s 54344, 52030, 46607, 38403, 29518. Fits Trimble model #s 5700, 5800, MT1000, R7, R8, Telxon, TSC1.